Another relationship having run its course, Jack Reacher boards a bus from Milwaukee heading northwest. No luggage, no regrets, just a toothbrush and the rules he must always follow. The rules dictate that whenever it’s time to leave a place, he must buy a ticket on the first bus out, no matter where it’s going. So that’s what he does. Only problem is, at the second rest stop in a nothing little town in the middle of nowhere he walks by a pawn shop, stretching his legs, and sees it. Not just any ring, though. West Point 2005. Inside the pawn shop, looking at the ring, he sees an inscription inside the band: S.R.S. 2005. So it’s not a replica, not a souvenir, not a trinket. It’s the real deal. A genuine West Point class ring. What else can Reacher do? He buys the ring and decides to return it to SRS, whoever he or she may be. Because a ring like this is always worn with pride. And it’s very hard to earn. And 2005 was a tough year to graduate. Yes, folks. Jack Reacher’s in the house. We’re also very familiar with the conventions that must be covered in each Reacher thriller. There’s an up-front brawl with seven biker guys outside a bar after which, of course, Reacher’s the last man standing. There are cops who think about arresting him but don’t because he’s an ex-MP with an obvious sense of justice. There’s a big-wheel bad guy pulling strings and manipulating the obstacles in front of Reacher as he inexorably plows forward. And oh yeah, there’s the quest. More or less randomly chosen, but rooted in that ineluctable sense of justice that motivates Reacher above all else, connected to the military mindset as it often is, and first and foremost in all Reacher’s thoughts and actions as soon as he makes up his mind to proceed with it. There’s absolutely no question, is there? He’s going to find the owner of that ring and give it back to them. Done deal. The big question, though, is Why? Why did that person give up the ring in the first place? And so another epic Reacher adventure unwinds beneath our page-turning fingers at the usual breakneck pace. 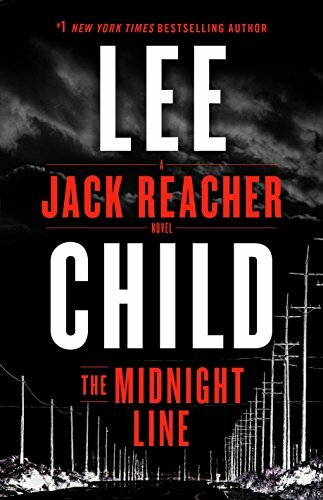 Although Lee Child stumbled badly with 61 Hours, made a partial recovery with Worth Dying For, kind of lurched sideways with The Affair, and then seemed to wander blindly around for the past few installments in the series, The Midnight Line puts Child and company firmly back on track. The character is once more consistent, the action is as delightful as expected, the setting is typically remote and empty, and the action, which occurs after intense analysis worthy of a military tactician or a kinesthesiologist, is a blast to read. Rack your seat back as far as it’ll go, folks, buckle up, and get ready for another bone-jarring, teeth-rattling truck ride with Jack Reacher. Just remember that he won’t stop until his quest is completed, and you won’t stop reading until the last page is turned.